Dr. Waldo was the brother of Abigail Waldo, the wife of David Bucklin. David was an uncle of Joseph Bucklin 5th, who fired the first shot of the Revolution and for whom this Joseph Bucklin Society is named. David Bucklin served in the Revolutionary Army, as did many of the Bucklins who were close relatives of Joseph Bucklin 5th. Waldo’s personal sacrifice and the goodness and effectiveness of his efforts for the soldiers (which included Bucklins at Valley Forge) resulted in David Bucklin naming a son “Albigence”. In memory of the events of the Revolutionary War, the David Bucklin family line deliberately continued to carry the name of “Albigence” for eight generations (two hundred years! ), either as a first name or a middle name of a Bucklin boy. Dr. Waldo’s niece, the daughter of his sister, was at the same time hungry and cold in a refugee camp in Canada in the winter, all because she had married a real hero of the British forces. Read her heartrending tale at our pages on Susanna Bucklin. The following is a short excerpt from the dairy of Dr. Albigence Waldo, the Surgeon General of George Washington’s Army, written in the trying days of December, 1977, when the Army was at a low point, at Valley Forge. 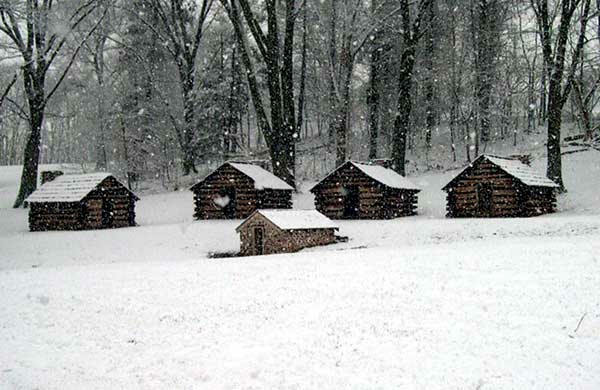 With the British Army having captured in Philadelphia, and settled into winter quarters there, the American army had to use Valley Forge for a campground. where they built 2000 log huts for the army of 12,000 soldiers. General George Washington had a substantial stone farmhouse for his camp home and army headquarters, far better than the quarters of the officers and troops. For more background, see StoriesOfUSA which maintains an excellent summary of the Valley Forge encampment and its place in the history of the Revolutionary War battles. The winter of 1777-1778 was a winter of hardship and suffering for the American troops. [Dairy Entry of Surgeon General Waldo] “December 14. Prisoners and Deserters are continually coming in. The Army which has been surprisingly healthy hitherto, now begins to grow sickly from the continued fatigues they have suffered this Campaign. Yet they still show a spirit of Alacrity and Contentment not to be expected from so young Troops. I am Sick – discontented – and out of humour. Poor food – hard lodging – Cold Weather – fatigue – Nasty Cloaths – nasty Cookery – Vomit half my time – smoak’d out my senses – the Devil’s in’t – I can’t Endure it – Why are we sent here to starve and Freeze – What sweet Felicities have I left at home; A charming Wife – pretty Children – Good Beds – good food – good Cookery – all aggreable – all harmonious. Here all Confusion – smoke and Cold – hunger and filthyness – A pox on my bad luck. Surgeon General Waldo’s dairy makes great history reading. The full original dairy is maintained by the Army as a military record, where it is not easily accessible. However, large portions of Dr. Waldo’s Revolutionary War personal diary notes are available online. An additional on-line source for more of Dr. Waldo’s diary is also available. A good overview of the Valley Forge history is found at the PBS site for teachers, which has a great deal of material “boiled down” to the essentials of the Valley Forge history. This PBS site uses Dr. Waldo’s dairy as a teaching aid about the Revolutionary War. As the Surgeon General of the Revolutionary Army of General George Washington, Dr. Waldo did a remarkable job of “on the spot” inspections and medical care, and in issuing orders which prevented disease and frostbite and which rationed food and supplies to keep the men in the army as healthy as possible, under conditions of great hardship. He kept a dairy through much of the war.